William Kenny, owner of Native, a nursery on Redding Road, talks with Louise Washer, from the Norwalk River Watershed Association, about plantings for a pollinator pathway. 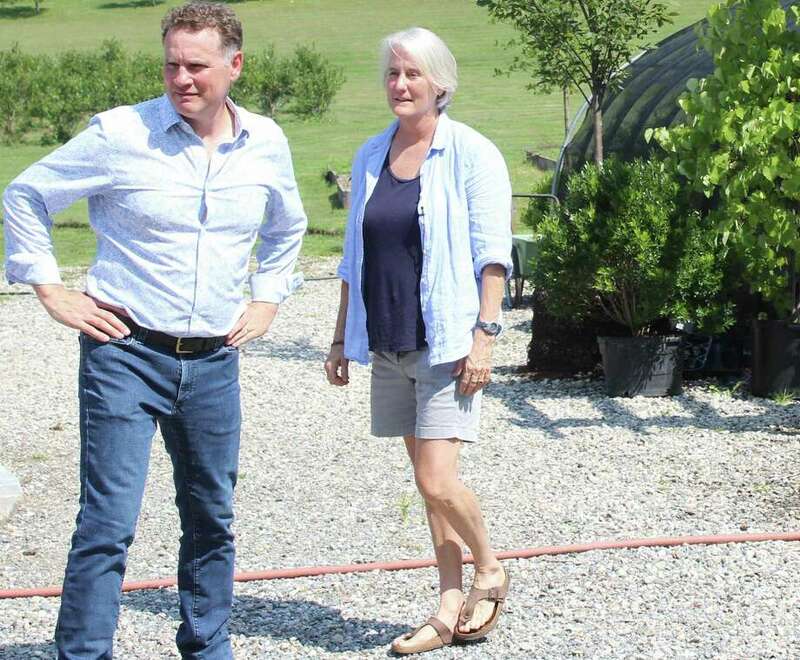 FAIRFIELD — It seemed like a natural extension of his landscape architecture business, and when “a couple of stars aligned,” William Kenny decided to open his own nursery on Redding Road in May. He’d been running William Kenny Associates LLC out of offices on Tunxis Hill Road for the last 15 years. The nursery, appropriately called Native, is located on the other side of town on Redding Road, and Kenny hopes the two will mesh almost seamlessly. “I’m both a designer and a scientist,” Kenny said while standing outside the Greenfield Hill property. It had previously housed a nursery, and Kenny has done work over the years for the property’s owner — a few of those “stars” he mentioned. The new nursery sells plants, trees and bushes that are native to New England, hence the new business’ name. On Wednesday, Kenny and his employees helped Donna Merrill, of the Wilton Land Conservation Trust, and Louise Washer, president of the Norwalk River Watershed Association, pick out pollinator plants for a project to build a pollinator path. They brought with them a production company that is making a documentary about pollinator conservancy. Pollinators are insects or animals that cause plants to make fruit or seeds by moving the pollen to fertilize the plant, and the idea is to use plants that are highly attractive to those pollinator — likes birds, bees, bats, butterflies, moths and beetles. The push for pollinator conservation is just one of the reasons for using native plants. Plants like black-eyed Susans, New England asters and butterfly weed will not only save time and money on maintenance, they also mean better overall environmental health and less potential for pollutants, he said. Native plants can be used anywhere, from suburban yards and coastline properties to fields and forests. And there are problems caused by planting non-natives, Kenny said. The problem, Kenny said, is the non-natives don’t necessarily provide the needed support to an area’s wildlife and bird life. “Some can become very invasive, particularly the vines,” he said. On Interstate 95, Kenny encouraged people to take a look either to the right or left when driving between exits 18 and 19. They’ll see the porcelain berry vine taking over, he said, which is what vines do. In the process, the vines smother trees and shrubs. For now, the majority of the plants sold at Native aren’t grown on the property, but the plan is to eventually have what is sold at the nursery grown there — truly native plants. When Kenny describes himself as both a scientist and designer, he’s not kidding. He is a certified professional wetland scientist, a soil scientist, a registered landscape architect and a certified organic land care professional with degrees from Yale, the University of Connecticut and the University of Massachusetts.